The following is a Discussion Post for a Western Philosophy Class at the College of the Siskiyous. 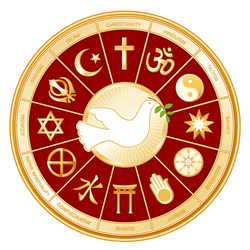 The topic: Focusing on one or two of the chapter 6 subheadings, describe how new elements are added to old religions, or vice-versa, old elements added to new religions. What challenge(s) do you see that these new or reviving old religions present to the main traditions of Judaism, Christianity, or Islam? I do find it strange that in the first part of chapter six, it states there are religions in Africa and I wonder how true this actually is. What if there is no religion in Africa but simply a way of life and then “civilized” people come along and label their way of life as “religious,” but that does not make it so. Before going on to the first learning activity, it is important to clarify two issues. First, we will use the term indigenous African religions and not traditional African religions; a term often used to identify and describe religious traditions that were found in Africa prior to the arrival of Islam and Christianity. We don't use the term traditional because of what this term means to many people. Tradition, to many people, means something old, something that has not changed-or that is resistant to change. Indigenous African religions are not "traditional" in this sense, they are dynamic (they are not resistant to change) and they are adaptable. Indeed, African religions have been influenced by Islam and Christianity, and, in turn, African religions have had an influence on the way Islam and Christianity are practiced in Africa. If these are traditions then why call them “religions” why make another or more religions for the world to fight over and convert each other from? Africa itself is proof that Islam and Christianity are not necessary at all, as they were functioning just fine until these “religions” came along to convert them, capture them, turn them to slaves because they were of the kind of nature that you could dominate. The old ways disappear because we kill anyone and anything that does conform or agree to the “standard” ways of being. A prime example of the old to the new and the loss of family structure is how they describe the Inuit/Eskimos. How they once had igloos and stories to take them through long winters they now have TV. Where they once were close to the land and nature, now they have high incidences of suicide among their young: “The stressors regarding the identity crisis among teenagers have led to disturbingly high numbers of suicide.” (Wiki). I wish the Natives won. As a kid I didn’t understand being called a “white devil” but going to school and learning history has revealed the reasons, and although I don’t consider myself “white” I know I have the blood of the ancestors that destroyed the Natives and I have the blood of the Natives that were destroyed. No wonder there has been such internal conflict in this lifetime. I also wonder why Native American’s ways are not considered a religion, but African ways are. In Oxtoby, it says “the Native way of life” regarding the traditions of that culture, and yet in this same book, they call the way of life of an African a religion. (476). We don’t need to add to the religions or merge the religions ... there is no religion needed to discover the Truth in your own Heart. Do not seek outside yourself. Be That which you seek. "Inuit." Wikipedia. Wikimedia Foundation, 30 Nov. 2014. Web. 2 Dec. 2014. <http://en.wikipedia.org/wiki/Inuit>. Oxtoby, Willard Gurdon. World Religions Western Traditions. 2nd ed. Oxford UP, 2002. Print. Petraitis, Richard. "Bullets into Water: The Sorcerers of Africa." Bullets into Water: The Sorcerers of Africa. Reall: Rational Examination Association of Lincoln Land, 1 Jan. 1998. Web. 2 Dec. 2014. <http://www.reall.org/newsletter/v06/n06/bullets-into-water.html>. "Unit Three: Studying Africa through the Humanities." Exploring Africa. Web. Accessed: December 2, 2014. <http://exploringafrica.matrix.msu.edu/students/curriculum/m14/intro.php>.